Patterns and stripes and zigzags. Oh my! The beauty and tranquility of Maui's premier Pacific Ocean view—as seen from the cabanas at the Four Seasons Resort Maui's Serenity Pool—just received a major fashion shake-up courtesy of one of Italy's top designers. The inspired designs of Missoni, the internationally-acclaimed fashion design house, has introduced its popular home décor styling, with its distinctive and colorful zigzag patterns, poolside at Maui's top-rated resort. And the resort's guests have responded with rave reviews. The two prime location cabanas, which offer unobstructed views of the ocean and the neighboring Hawaiian island, now feature Italian flair to accompany the new decked-out design. Guests who book the cabanas will find such special amenities as a personal cappuccino machine, a refrigerator stocked with Italian gelato, Pellegrino waters and champagne, the Missoni Style book, Missoni-designed terry cloth towels and much more. As with all Four Seasons cabanas at the Serenity Pool, Missoni Cabana guests will enjoy a rotation of many other complimentary amenities delivered by pool staffers -- chilled fruit sticks, frozen lemonade pops, brownie bites, cucumber eye pads, Evian "spritzes," a selection of suntan lotions along with a menu of mini treatments from the spa performed en-Cabana. The cabanas are also equipped with 42-inch flat screen televisions with noise cancelling earphones, ceiling fans and complimentary Internet. 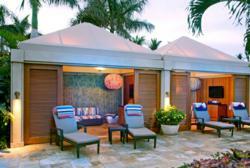 The ocean-facing luxury cabanas can be reserved for $495 per day. "We are pleased to welcome Missoni Home to Four Seasons Resort Maui and to work closely with Seaside Luxe, our partner who manages a trio of new luxury boutique shops at the resort, to showcase these Italian-inspired cabanas at the Serenity Pool as well as a new lounge just outside our 22 Knots boutique." says Thomas Steinhauer, regional vice president and general manager, Four Seasons Resort Maui. "We are always looking to introduce and incorporate the latest trends and thinking from around the world. Our goal is to push traditional boundaries to give our guests a truly memorable vacation experience." 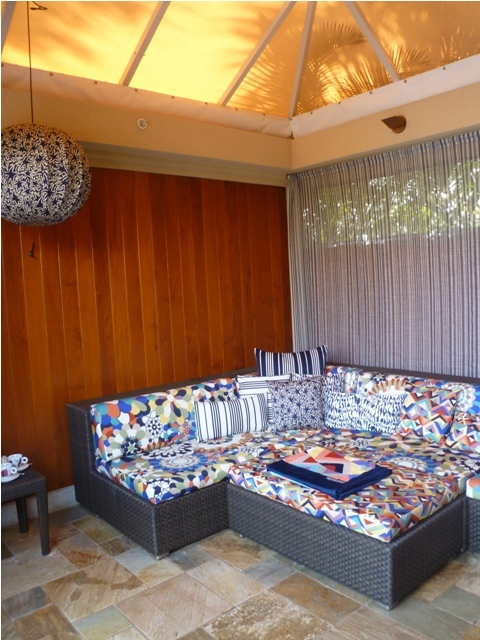 The concept behind the Missoni Home cabanas is to let guests fully experience the Missoni Home lifestyle. Christopher Philips, brand manager America for Missoni Home, says: "Rosita Missoni wanted to create an environment that is reflective and inspired by the lush and dynamic landscape of the area around Four Seasons Resort Maui. Guests will see large bold kaleidoscopic and leafy florals representing the botanicals tied in and coordinated with our classic Missoni stripes and zigzags which represent the jagged rocks and the sea. It is our goal to inspire people to live in the joy of color and pattern." Designed by Rosita Missoni, produced and distributed by leading textile manufacturer T&J Vestor, the Missoni Home line was added to the company’s product range in 1983. Renowned since 1921 for the quality of its homewear, T&J Vestor is run in partnership by the Torrani family and Alberto and Giampiero Jelmini,Rosita’s brothers. The Missoni Home collection has enjoyed growing success and expansion in recent years, developing a strong international reputation. Home furnishings now account for a considerable part of the brand’s production, as well as a rich assortment of textiles and accessories. Missoni’s outstanding creativity and timeless style and T&J Vestor’s leading technology and market knowledge combine to create the winning elements of worldwide acclaim based on imagination and innovation. For more information, visit http://www.missonihome.com.